Obama shot in the foot by the Norwegians? Most of us are delighted with the change of tone out of Washington since the new administration took office. But does that really justify giving the Nobel peace prize to Barak Obama? There is a huge gap between his words and accomplishments. The logic behind the Norwegian Nobel Price Committee seems to baffle the world, not least President Obama himself, who feels he is undeserving. If King Abullah of Saudi Arabia had been Western he would probably have been awarded the Nobel Peace Price instead of Obama. Presumably the committee is hoping that by awarding him the Peace Price they will encourage him to accomplish feats that will, in due course, justify the price? If that works, maybe it would be a good idea to make the North Korean leader the next recipient? Am aware that all US presidents are routinely nominated for the peace price. Actually, so is even Osama bin Laden. But doesn’t there have to be some kind of logic behind the Norwegian committee’s decision? By giving it to Obama they may have just shot him in the foot and made sure he is not re-elected? The world’s expectations may now be raised so high he can not possibly live up to it? He has already discovered that it’s easier said than done to reverse the Bush administration’s national security policies. The same day he was awarded the price he had a meeting with his national security team about escalating the war in Afghanistan. Not because he wants to but because it may be the only alternative unless the world is prepared to accept another failed state. Getting the Nobel peace prize gives a signal to the world that has a positive impact on the recipient’s ability to exercise power. Don’t think the US presidency needs a helping hand in that respect. Ridding the world of nuclear weapons, stopping global warming and bringing peace to the Middle East is easier said than done even for an American president. Too many vested interests that can not be ignored will work against him. If he has the courage to go against them he will, like George Bush senior, discover that he will not be re-elected. There are many people in the world that it would have made much more sense to give the peace prize to. Morgan Tsvangirai, the PM of Zimbabwe, is just one example. He has been almost beaten to death several times and been to prison in order o bring peace to Zimbabwe. Personally I would have liked King Abdullah of Saudi Arabia to get it. No other Arab leader has done more than him to try to restart the Arab-Israeli peace process. The King’s peace initiative giving Israel recognition by Arab countries if they return to the 1967 borders has been lauded internationally. Saudi foreign policy has been remarkable in its consistency and reliance on diplomacy to mediate inter-Arab disputes. After all, the peace settlement that ended the Lebanese civil war was mediated in the Kingdom and King Abdullah even attempted to mediate Saddam’s grievances against Kuwait in the fateful summer of 1990. The Kingdom never resorted to military force in its various territorial disputes with countries such as Iraq, even though KSA boasts one of the most formidable high-tech weapons arsenals in the region. The 2006 war between the Hezbollah and Israel was stopped when King Abdullah sent an envoy to Teheran with a message that actually made the Iranians tell the Hezbollah to back off. But the Norwegian committee would not have dreamed of giving it to him simply because he is the king of Saudi Arabia. Instead they seem to be gripped by the Obamafever that is so prevalent in Scandinavia. But by lumping Obama with the likes of Nelson Mandela and Lech Walesa, the Nobel peace prize judges have already managed to infuriate conservative US commentators, making sure there will be no peace for Obama on the home front. Wouldn’t it have been better to wait until he had achieved more? If their decision contributes to making Obama’s task harder, maybe it’s time to have a look at who the judges are to assure they have a positive impact on peace in the world? As it is, the prestige of the price is beginning to disappear. And I’m sure that’s not what Alfred Nobel had in mind. Without in any way arguing with your post,i ask though; since the date of your said post,would you still say that nothing has changed at the White House and/or on the global political thinking? !…Might the Nobel Committee have foreseen something we couldn't? !…Should the re-election or otherwise of President Obama have weighed in the mind and decision of the Committee?! Please read the article I just published on April 12th and that should answer your question. Giving the prize "in anticipation," as it were, will certainly downgrade its importance as it will be almost impossible to live up to expectations. The prize should be give for achievements, not encouragement in advance! As you say, there were many deserving recipients so it's not as if they were short of candidates! 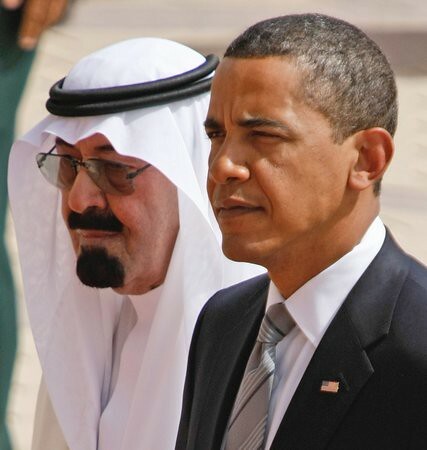 Saudi Arabia does not permit freedom of religion, since all citizens are required to be Muslims. Doing anything to teach or spread non-Wahhabi Islam is prohibited. Freedom of (non-Islamic) worship is not guaranteed under any Saudi law, and preaching and public practice of non-Muslim religions is prohibited. Non-Muslims risk arrest, imprisonment, lashing, and sometimes torture for any overt religious activity. Conversion by any Saudi Muslim to another religion is punishable by death. Persecution against Shi’a is rampant and not only officially tolerated, but encouraged. Complete freedom of speech and of the press are unknown in Saudi Arabia. Saudi law does not require children to attend school. Saudi women are required by law to cover themselves in public by wearing an abaya, which completely covers their hair and body, and can be arrested by religious police if they don’t. Many Saudi men believe women should be completely separated from men in public life. They also believe a woman should only get enough education to learn the skills necessary to take care of their homes and families. Saudi women are expected to be mostly good wives and mothers, and are not supposed to speak to men or be with them unless they are family members. Women and girls live in separate rooms from men and eat in a separate area of the home. Girls are separated from boys in school and taught only by female teachers. If a woman wants to go out, she has to have a male relative go with her or have his written permission. Women are not allowed to attend sports events, and Saudi Arabia is the only country in the world where women are not allowed to drive on the public roads. Saudi Arabia is to be commended for its proposals that encourage recognition by Arab countries if Israel returns to the 1967 borders, but this is hardly a new idea. It’s just a modern restatement of Israel’s old “land for peace” strategy, which itself was based on UN Security Council Resolution 242, which requires Israel to return to its 1967 pre-war boundaries. With regard to King Abdullah, saying that “No other Arab leader has done more …to try to restart the Arab-Israeli peace process” is disingenuous, since, with the exception of Sadat and King Hussein, the Mideast hasn’t really seen *any* Arab leader trying to even make peace with Israel (as opposed to negotiating ceasefires and/or conclusions to various Israeli-Arab wars). Saudi Arabia long has been a dedicated opponent of Iranian influence in the Mideast, viewing Iran as a regional competitor to the kingdom’s status within the Islamic community stemming from its custodianship of the holy sites in Mecca and Medina. I cannot imagine any circumstance under which anything Saudi Arabia, which actively persecutes Shi’a, had to say about the Shiite group Hezbollah would have any weight with Iran, the world’s largest Shi’a nation and Hezbollah’s sponsor. The end of the 2006 Israeli-Hezbollah War had more to do with the United Nations’ Security Council Resolution 1701, which was based on the Siniora Plan by Lebanese Prime Minister Fuad Siniora, than with any action of Saudi Arabia, which apparently restrained its efforts to supporting the process through the Arab League. Steven, I doubt that you have lived and worked in Saudi Arabia – or even visited for that matter. But it's a free world so you are entitled to your opinions. It will obviously surprise you to note that I held a senior management position in a 100% Saudi owned conglomerate in Riyadh and that my best girlfriend in Saudi has her own talk show on Saudi television. You write really nice stuff about the country of Saudi Arabia and their people and even the government. From your profile I believe you are from Sweden. I understand you have lived in Saudi for quite some amount of years of your life. But it is really nice to see that you still are quite pro Saudi. I know lots of people from the western world who have lived in Saudi for majority of their lives but are not as pro as you are. I am not trying to get into division of people. I know – "to each its own." But it is really nice to see you follow even their foreign policy in such detail. I use to always feel King Fahad was very pro American and because of him the country was quite Americanized. We lived there during his rein and even little bit during King Khalid's rein. My parents have lived even during King Abdullah's rein. You have my email id. If you can email me then it would be quite nice to talk to you in detail. I promise I will not spam or make any wrong use of your email id. Or any other personal information of yours. Thank you Adam. Glad you are pro Saudi Arabia as well. Do keep in touch with me here on my site and participate in the discussions.